In a medium bowl, mix the pumpkin, evaporated milk, sugar, eggs, cinnamon and salt. Pour the mixture into the baking dish. Sprinkle cake mix over the pumpkin mixture. Drizzle with butter. Top with pecans. Bake in the preheated oven 50 to 60 minutes. Cool before serving. Awesome, I used pumplin pie filling instead of plain pumpkin. Will definately make again!!!! Excellent! 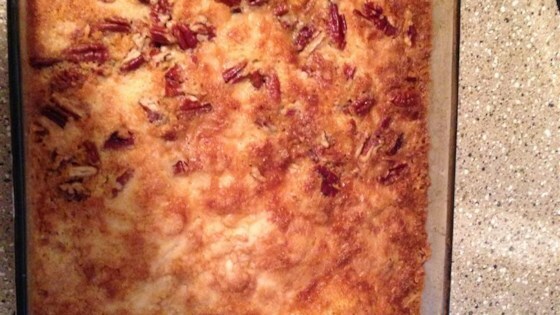 This has become one of my new favorite Thanksgiving Day desserts. I almost prefer it over a regular pumpkin pie! Great flavor. Crust was very thick and difficult to cut without making a mess. Inverted onto a plate and took care of that problem.